PR leaders have expressed serious concerns about proposed EU copyright laws that could dramatically change how content is shared on search and social media. They warn the changes threaten the core principle of PR - access to information. The new EU rules, passed European Parliament yesterday, supported by 348 MEPs to 274 against. EU member states must now approve the decision and, if they do, implement it within two years. If the UK 'Brexits', they would also only apply during a prolonged transition period. 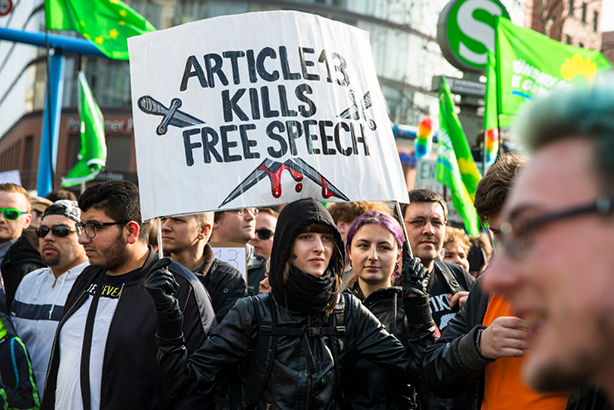 The EU Copyright Directive includes two contentious areas that could impact PR. The first is a ‘link tax’ (Article 11) that states search engines and news aggregators should pay to use links from news websites. The second area is an ‘upload filter’ (Article 13) that places the legal onus on larger tech firms to proactively police copyright infringements on their platforms, such as users sharing copyright-protected videos produced by music artists and news organisations. The tech industry – including Google and Facebook – has lobbied heavily against the changes and warned of unintended consequences. Critics argue the rules will be impossible to implement due to the sheer volume of copyright-protected material that is already shared on platforms like YouTube and Facebook, and that a content ID system would only work if all rights holders provided clarity, making it ‘too risky’ to let anyone in the EU upload content. The rules do not apply to memes and GIFs, which have been exempted on the current version of the EU Copyright Directive. The tech titans have allies in the PR and communications industry, who argue the rules could spell an end to ‘viral’ content and Google News. "As the PR and communications industry has said time and again, link taxes and upload filters threaten the core principle of access to information," warned PRCA director general Francis Ingham. "We remain deeply concerned that these supposedly good intentions simply do not add up and that the EU Copyright Directive represents a misguided attempt to regulate the internet in a way that is as detrimental to practitioners as it is to the public. Ultimately, this will hamstring aggregating websites and applications and drastically reduce the public's ability to engage properly with news and content." The CIPR chief executive Alastair McCapra described the EU’s copyright laws as "a step backwards" for internet freedom and "a blow to Europe’s creative and digital economy". He added: "The Directive will force restrictions on the way PR professionals work and deliver value for clients and businesses across Europe. The CIPR has long opposed the legislation and will continue to speak up against the Directive." Andy Barr, founder and MD of comms agency 10Yetis, warned that upgraded content filters could struggle to decipher "between prohibited content and light-hearted, spoof postings", potentially applying the handbrakes on content designed to go viral. "This could cause problems for the social media industry, because memes and GIFs have historically been such an easy way to – for want of a better term – ‘go viral’, and now content that teams create could get blocked for copyright issues under the watchful eye of these new upload filters that will have to spring into action despite the fact that they may not actually breach any rules," Barr said. "If anything, though, this will encourage social media teams and marketers to come up with more creative, original content – which to be honest could be a breath of fresh air for the industry." 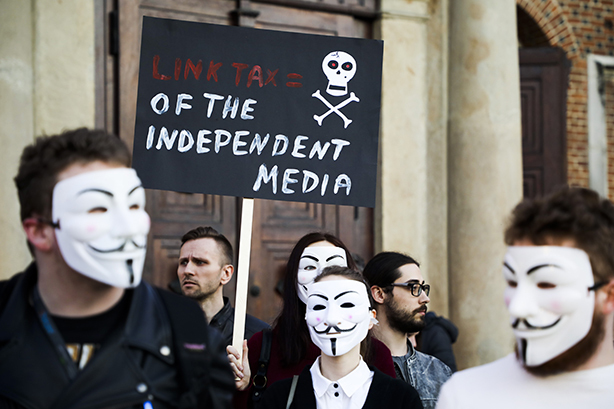 The rules relating to a link tax could be welcomed by news organisations. As digital advertising budgets that traditionally supported news organisations have shrunk and digital ad budgets have shifted to Google and Facebook, media companies have complained the digital duopoly unfairly benefit from news content published in their walled gardens. Publishers have often complained they do not receive as much ad revenue or traffic benefits for content that is published within faster-loading Google AMP and Facebook Instant Articles than they do for content that resides on their own news websites. Publishers with paywalled content have also expressed concerns about aggregators like Google News, which in the past have penalised articles on its search rankings that are not freely available on the internet. "Google has already hinted that it may have to shut down Google News, which is detrimental to the PR and media industry, as it means that stories might not get as much reach," Barr explained. "Hopefully, the implications of this will mean that some sort of solution is thought up to benefit everyone, instead of creating such a restrictive environment for sharing on the net." Another unintended consequence, warn critics, is that only incumbent tech giants like Google, Facebook and Twitter would be able to operate in such a tightly regulated, user-generated content environment, which could prevent new content-sharing platforms from emerging.